The Alaska Center for the Environment, Alaska Public Interest Research Group, Alaska Transportation Priorities Project, Alaska Wildlife Alliance, Cook Inletkeeper, Environmental Defense, and Government Hill Community Council submitted comments opposing the proposed addition of the Knik Arm Crossing to the long range transportation plan (LRTP) and the transportation improvement program (TIP) for Anchorage…neither AMATS nor USDOT has completed a major investment study (MIS) in accordance with 23 U.S.C. Sect. 134 and 23 C.F.R. Sect. 450.318. Until AMATS or USDOT prepare an MIS that analyzes the impacts of and alternatives to the Knik Arm Crossing, AMATS cannot add the Crossing to the LRTP or the TIP. To read the complete set of comments, please click here. To read the Johnston Study, please click here. To read the Balbus Study Part 1, please click here. To read the Balbus Study Part 2, please click here. What: Civil engineer Michael Replogle with Environmental Defense in DC (www.environmentaldefense.org), a national expert on public-private partnerships and how they can be structured to protect communities and the public interest, will be speaking in Anchorage on The Knik Arm Bridge Public-Private Partnership: Smart Transportation for the Anchorage Region? 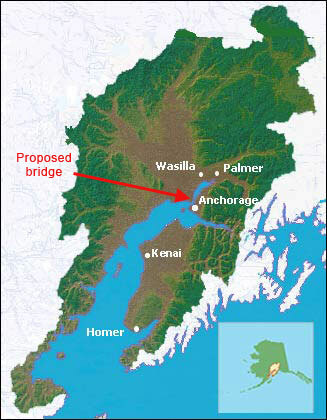 The presentation will help Anchorage and Mat-Su Borough decision-makers and residents understand the implications of the Knik Arm Bridge and Toll Authority (KABATA) engaging in a Public-Private Partnership agreement with private investors. Sponsors: Downtown, Fairview, and Government Hill Community Councils; Alaska Center for the Environment; Alaska Conservation Alliance; Alaska Public Interest Research Group; Alaska Transportation Priorities Project; Anchorage Citizens Coalition; and Friends of Mat-Su. When and Where: Tuesday, June 19, 7-9 pm, Rasmuson Hall 101 at UAA (see #5 on the campus map, http://www.uaa.alaska.edu/map/); free parking. Additional Information: Mr. Replogle also will speak to the Business and Economic Development Committee of the Anchorage Chamber of Commerce on Wednesday, June 20, from 11:30-1, at the Anchorage School District building (5530 East Northern Lights Blvd.). The meeting is open to all, but only Chamber members may participate in discussions. “Anchorage’s Endangered White Whales.” To view this 5/26/07 Far North Science story, please click here. 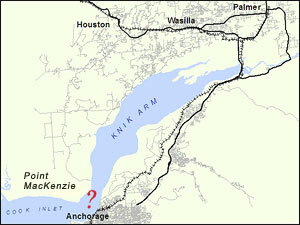 “Alaska’s Megaproject Mentality – Part 1.” To view this 3/5/07 Insurgent 49 story, please click here. Or view an archived copy here. To view the Hays Research Group Poll Methodology and Documentation, please click here. ABSTRACT: The proposed Knik Arm Bridge project poses a serious risk for private investors, with large uncertainties in project costs, funding, permitting, and liability. This report documents those uncertainties. « This is Last Page of Archived Posts - Return to the archive list. OR: Return to the home page.